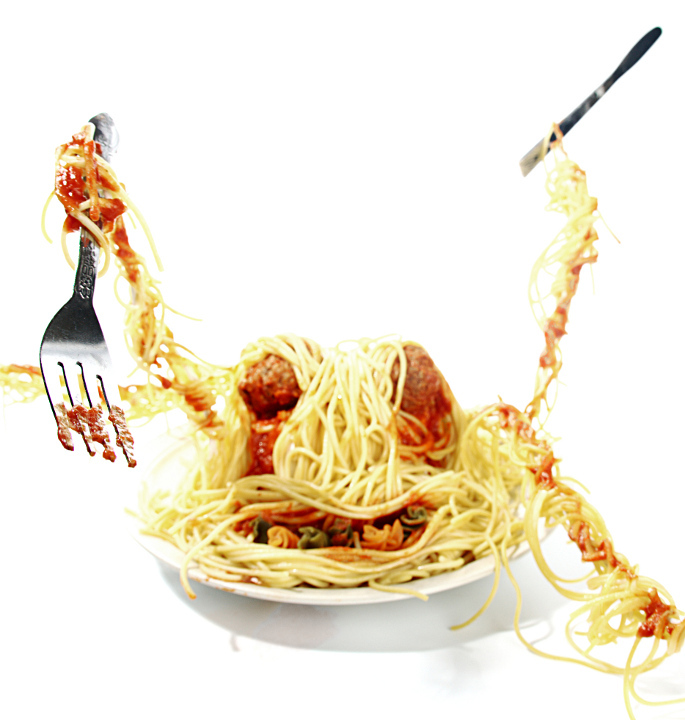 Created four arms using a sturdy electrical wire, then glued spaghetti along the arms. The center spaghetti has a bowl in it to give it shape. I went back and forth between this photo and a couple of others. The others keep the pasta monster in focus, but I can't help but feel he is just too messy looking to be kept in focus. I think his "face" is better defined when it is blurred. I hope I'm right. There were a lot of concerns in making this photo. Pasta is not known for keeping well out of the pot for very long, so time was an issue. It had to be attached it to wire to give it form mainly using glue. Glue and wet noodles aren't a great combination, so the noodles need to set a little bit. Unless you've made a pasta monster before, you really don't know how it should look when it is finished. I had an idea before I began, and now I have a better idea of how it should be done better. In general I don't think my pasta monster was particularly photogenic. By that I mean it looked more like a mess than it did a monster. That is why I selected a photo with the focus on the fork rather than on the pasta. I went against family and friends when I made that decision. Perhaps it was the wrong one, but I felt I would rather be chastised for being OOF rather than not having a convincing monster. I also felt the blurry focus gave the monster more of a horror quality. I think I failed most with the lighting and the background. The followers of the religion "The Flying Spaghetti Monster" are sure to see this as a sign and aplomb76 is soon the be sainted. Coincidence ? I think not! LOL!!! Thank you for your your comment. I do believe I was shall I say "touched" by the FSM and compelled to create it. I sent an email to venganza.org offering to let them post my photos in support of the cause. I really liked this shot but the focus/DOF thing really hurt you. Looked at the outtakes and (IMHO)I'm pretty sure they would have scored very high. Good idea and the shots as a collection are great! Message edited by author 2009-09-07 19:00:50. Very much underrated. Silly idea, but Kudos for effort and creativity. Looks like that was fun to create. Some meals are not meant to be eaten. They are meant to be stabbed repeatedly until they no longer pose a threat. Looks like it's going to eat me ! :) Nice setup and cool imagination on this. lol, rotfl!!!!!!! funny psycho pasta!!!!!!! this is just to funny...how on earth did you do that...wire coat hangers? Very fun and creative idea... I think the pasta gets lost in the white bg though, perhaps black or red would have been more dynamic. A little oof with the meatballs also, but a 6 for creative genius. Its a great photo and super creative as well!!! It tells a story: You can actually think the pasta is coming for you! Beware of my calories! No one can actually tells how dangerous pasta can be! I feel like Calvin from Calvin & Hobbes! It's a cute idea but it's not in focus. Proudly hosted by Sargasso Networks. Current Server Time: 04/18/2019 06:23:37 PM EDT.